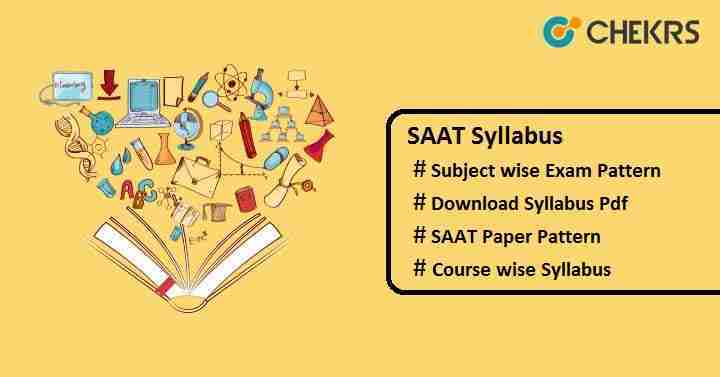 SAAT 2019 Syllabus Pdf Download: To get selected for admission in the SOA University for the academic session 2019-20, students will have to give SAAT Entrance Test. All candidates who are thinking to apply for this exam should check the SAAT Exam Syllabus first. The syllabus for undergraduate programme such as BTech/ DDE/ BPharm/ BSc Ag./ BSc Nursing will be from of class 11 & 12 Physics, Chemistry, Mathematics/ Biology subjects. With the help of SAAT 2019 Exam Pattern & Syllabus, candidates can make strategy for the exam preparation and also get clarity of each and every topic. See the topic in the table below and prepare for the exam accordingly. The exam pattern will give the overview structure of the question paper of the SAAT exam. SAAT Exam Pattern will be set by SOA University. Here we have provided the exam pattern based on the previous year exam. 1 mark will be deducted for every wrong response. We hope that the content provided in this article is sufficient for all the candidates searching for the SAAT Syllabus Pdf. You may ask your query related to SAAT syllabus and exam pattern by commenting in the comment section given below. Till then visit this site to get more updates. Good Luck!! !